President-elect Barack Obama's incoming Chief of Staff, Rahm Emanuel, called for major reforms to our nation's health care, financial, and energy systems at the Wall Street Journal's CEO Council today, challenging CEOs to embrace an ambitious reform agenda. "When it gets rough out there, a lot of business leaders get out of the car and say, 'We're OK with minor reform.' I'm challenging you today, we're going to have to do big, serious things," Rahm Emanuel said, speaking at a forum convened to elicit corporate opinion on the challenges facing the new president. The soon-to-be White House Chief of Staff said the Obama Administration saw the economic crisis as an opportunity to advance a suite of bold solutions that would put America back on track. "You never want a crisis to go to waste," Mr Emanuel said, before continuing, "and what I mean by that is it's an opportunity to do things you couldn't do before." Mr Emanuel said the incoming administration would "throw long and deep," taking advantage of the economic crisis to advance wholesale changes in health care, taxes, financial re-regulation and energy. "The American people in two successive elections have voted for change, and change cannot be allowed to die on the doorsteps of Washington," he said. As would be expected, Mr. Emanuel promised that a major economic stimulus package would be "the first order of business" for Mr. Obama after he takes office January 20th. Unlike the Bush Administration's stimulus package passed this Spring, which focused heavily on personal rebate checks and business tax cuts, Emanuel said the focus of spending under the Obama Administration will be on infrastructure. Mr. Emanuel said the spending would center specifically on "green infrastructure" investments, which he said would include mass transit, upgraded electricity transmission lines, "smart" electrical meters that allow consumers to save money by using electricity at off-peak hours, and universal broadband Internet access, which he said would encourage telecommuting. Emanuel also stressed Obama's commitment to addressing climate change, citing his meeting with his former Republican rival, Senator John McCain on Monday. Emanuel reported that Senators Obama and McCain met in Chicago on Monday and discussed making a market-based system to control global warming "a top priority" of the new administration. Obama delivered a taped video address to a summit of global climate leaders in Los Angeles yesterday voicing a similar commitment to capping greenhouse gas emissions and investing in a new, clean and efficient energy system. Emanuel also used the opportunity to call on the business community to join the new administration in a push for universal health care, saying incremental increases in coverage won't be acceptable. Mr. Emanuel also characterized a renewed effort to expand union membership as an understandable effort to address the concerns of a middle class that's seen wages stagnate over the last eight years. He said business leaders should help the Obama Administration find solutions to the middle-class squeeze or face a revolt. "We need a strategy as a country to make sure they have an opportunity to move up that ladder," Emanuel told the assembled CEOs and business leaders. Mr. Emanuel gave up his seat as a Chicago Congressman to accept the top position among President-elect Obama's staff. The tough-minded Democrat will be the main point person between the White House and Capitol Hill. "The world's energy system is at a crossroads. Current global trends in energy supply and consumption are patently unsustainable - environmentally, economically, socially. But that can - and must - be altered; there's still time to change the road we're on. It is not an exaggeration to claim that the future of human prosperity depends on how successfully we tackle the two central energy challenges facing us today: securing the supply of reliable and affordable energy; and effecting a rapid transformation to low-carbon, efficient and environmentally benign system of energy supply. What is needed is nothing short of an energy revolution." This kind of stark warning may be nothing new if you're used to reports from folks like Greenpeace or even the IPCC. But the language in this IEA report stands in stark contrast to the tone of past agency reports, which tend to range from "bland-to-cornucopian," as Oil Drum blogger Nate Hagens aptly puts it. Investments, not reserves, constrain oil supply. The IEA concludes that the world's oil reserves are "in principle, large enough" for output to continue to grow, but notes that the massive scale of investments required to keep pace with global oil demand and depleting mature oil fields will be the constraining factor. 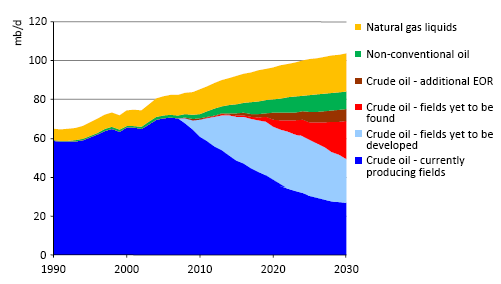 World oil demand is projected to grow from 84 million barrels per day (mmbd) in 2007 to 106 mmbd in 2030 in the reference case (a frozen-policy base case). To meet growing demand and replace depleting oil fields, 64 million barrels per day of new oil production must be brought online between now and 2030, an amount equal to over three-quarters of current total oil production capacity. 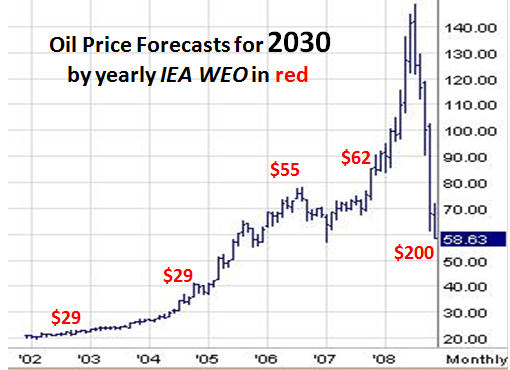 30 million barrels per day of new capacity is projected to be needed by 2015. Bringing on those new supplies will require a massive investment of capital. The IEA projects a cumulative need for around $8.4 trillion in investment for the oil and gas sectors between 2007-2030, or a $350 billion annual investment. $26.3 trillion in energy investments needed: Cumulative investments in energy supply infrastructure amounts to $26.3 trillion between 2008 and 2030. $13.6 trillion is needed for the electricity sector, split half-and-half between electricity generation and transmission. Global greenhouse emissions are projected to rise 45% by 2030. Senior Breakthrough Fellow, Roger Pielke Jr. thinks even these projections are dramatically underestimated. Developing world drives energy demand, emissions growth: Driving by rapid economic growth in developing nations, non-OECD nations are responsible for 97% of projected emissions growth in the IEA's reference scenario, and all of the projected increase in oil demand. Three quarters of projected emissions growth will occur in China, India and the Middle East alone. Currently operating power plants responsible for 75% of emissions in 2020. The IEA calls attention to the slow rate of capital turnover in the power sector, where long-lived power plants currently operating today will be responsible for three-quarters of projected emissions in 2020. Achieving climate stabilization coals will require more than simple providing clean energy to meet new energy demand and must address these already "locked-in" emissions from existing power plants. "Current global trends in energy supply and consumption are patently unsustainable - environmentally, economically, socially." -International Energy Agency, in the Executive Summary [pdf] to their recently released World Energy Outlook 2008 report. With a new bailout for Detroit on the table, there's a lot of talk about getting some "grand bargain" with automakers out of the deal: automakers will agree to some terms, like producing more efficient vehicles, in exchange for the loans. In fact, the direct loans approved by the 2007 Energy Bill require auto companies to use the funds to retool factories that produce vehicles that get 25% better fuel economy than the average vehicle in it's class. That's a start. 2009 to 2014: improve at 4%/year to something like 30 mpg. A deal like that would mean America is committed to radically - not incrementally - re-inventing the American automobile, re-committing to innovation, and recapturing the competitive edge in automotive technology. We are currently soliciting guest essays that answers the question: What will it take to reinvent the American auto industry? We will publish the best responses on our home page, www.thebreakthrough.org. Please submit your op-eds to oped@thebreakthrough.org.